Shuts down leaks with exceptional structural strength without deteriorating. Garon Plug™ contains no metallics so repairs will not rust or deteriorate. 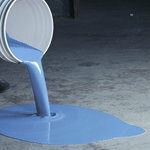 Repairs concrete and plug pressure leaks. Fast acting Garon Plug™ seals pressure leaks in concrete masonry quickly and permanently. Garon Plug™ fills areas around utility pipes to prevent water, moisture and pest/insect infiltration. Garon Plug's smooth putty-like consistency makes for an easy application. Fast set time for instant repairs by water, gas and electric utility underground crews. Makes emergency repairs fast, simple and permanent! 73 linear ft. at 3/4"
@ 70F: Set time: 3 - 5 minutes. Single component in a 5 gallon pail for easy application; Components Include: 50 lbs powder. Garon Plug™ is approved for shipping to all 50 states by ground or air.